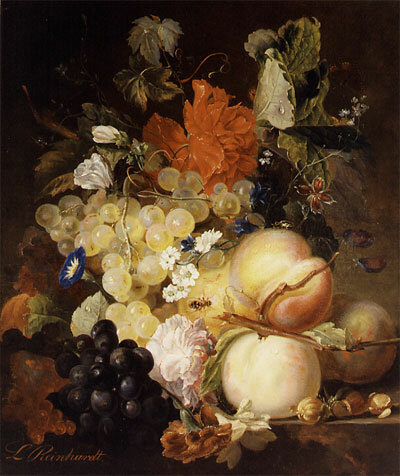 Still Life of Flowers, Fruits and Insects, about 1850/60. Oil on canvas, 41 x 34.5 cm (16.1 by 13.6 in). Signed. Decorative and splendor original frame with crafted floral Baroque ornaments. Dimensions framed: 48 x 41cm (18.9 by 61.1 in). A magnificent still life of the 19th Century by the German artist, which worked primary as flower painter with much attention to detail. The impressive composition is related to the still lifes of Jan van Huysum. Depicting also insects and water droplets on the leaves in a delicate trompe l oeil painting. Literature: Thieme-Becker, vol XXVIII, p. 123. Notes: ... The still lifes of Jan van Huysum are characterized by a bright background and a sparse, mostly of pastel dominating colors, like his depictions with outdoor character. Stylistically therefore his works belong already to the 18th Century, and he became a paragon for several generations of still life painters of the 18th and 19th Century... (see E. Gemar -Koeltzsch, Dutch still-life painters in the 17th Century, vol 2, pp. 524-529). We are grateful to Dr. Helmut Leppien (Director of the Museum Hamburger Kunsthalle), Mr Ahrens (Senate of the City of Hamburg, State Archives) and Mr Hermann Fuchs (Director of the Botanical Gardens, Hof/Saale), for the assistance. A impressive flower still lifes of the 19th Century in fine original condition. The strong demand for traditional European flower still life paintings continues and quality works are becoming increasingly difficult to find. Further details and price on request.